Just removing the old aerial was awkward enough…..
A pair of Ks, and problems with wall anchors…. 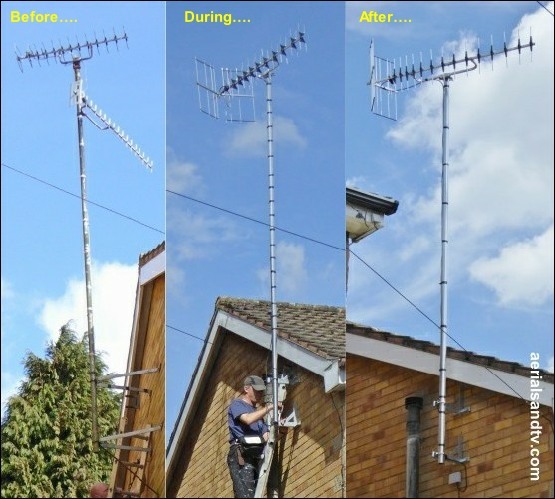 Let`s face it, most aerial installations are quite straight forward, particularly after the power was increased at digital switchover, and doesn`t the latter seem a hell of a long time ago…… However, occasionally you`ll get a buggar of a job, and this was one. Now we warn these predictors aren`t always that accurate, and this really was a case in point. I`d looked at the prediction and thought oh yes, Emley Moor will be fine, in fact I`ll use a high gain B group aerial and get a really decent signal. Just to be sure, when we got the keys one of the the first things I did was get a DM Log on a short piece of cable, plug it into my signal meter and point it at Emley out of the upstairs windows. The aerial would be up to 12ft lower than when erected on its pole but it`d still give a fair indication of the signal I could expect. None were even at the minimum advised threshold for digital reception, 45dBμV, in fact they were substantially under that threshold. Equally worrying the maximum signal varied in direction for different frequencies, a classic sign that signals were being bounced all over the place. This was unsurprising because the site is in a valley, and, worse, the direction to Emley was straight through a tree and then a big house at a higher level. I might have got a better line of sight if I could mount the aerial on the eastern corner of the house but that would be even higher and more awkward to get to on ladders, and, the house owner concerned had just got planning permission for a large extension which would negate any advantage. Belmont wasn`t mentioned on the DUK checker but the existing (unused) aerial was on that TX. Unfortunately its signals, though (surprisingly) better than Emley`s, were too still low to be a possibility. Oughtibridge had significantly better signals than Emley or Belmont but being a relatively small repeater it doesn`t transmit all the channels. There was, however, another possibility, Crosspool / Sheffield. None of the neighbours were on it and the DUK checker was saying only the PSBs (MUXES 1 to 3) would receivable, and even then they`d be poor. But I thought I`d try it anyway. The results were potentially encouraging. They were still too low, but I surmised that if the aerial were mounted 12ft higher (+ 2dB or so ? ) and a high gain aerial was used (+ another 4 to 5dB ? ) plus I could add a mast head amp if required, it might just work……. I could see why many neighbours had given up on aerials (the previous owner of the house included) and just had satellite dishes. I, however, was made of sterner stuff, plus I wouldn`t have a satellite dish on my house under any circumstances. Call it a hangover of my ancient detestation of Sky, plus I don`t like the look of them. Right, so onwards we go. The next problem was removing the old rather dilapidated aerial installation which was a two aerial affair on Oughtbridge and Belmont (not diplexed). The aerials looked rather battered (one was a Contract which I wouldn`t have on my house anyway), the whole edifice moved about alarmingly in the wind and it looked a bit of an eyesore. Why did the install have huge stand off brackets when they simply weren`t needed ? The existing tripod brackets had a 23” standoff when only about 7” was actually required ! Unfortunately, fairly quickly, another problem became apparent. There`s only a gap of about 1.8m between the houses, so, in order to access the aerial installation, at the top of the gable remember, I would have to go onto my neighbour`s garden to get the angle on the ladders. Actually, the angle on the ladders would have to be more acute than recommended even if I were able to foot the ladders right up against my neighbours wall, but, unfortunately, since the aerial was put up twenty five odd years ago, a “lean to” shed had been built right where the ladders needed to go ! In fact it was absolutely bang slap in the wrong place ! Now my neighbours couldn`t be more helpful and accommodating, but asking them to demolish their shed was perhaps expecting a bit too much….. I had no idea how we`d get the old aerial install down, or even if it was possible at all without a huge cherry picker. This was all beyond me, it was time to get Sean the aerial installer onto it ! And get onto it he most certainly did. After he pondered the problem for a while he decided to rest his ladders on the side of the tripod style wall brackets, which he did, but made sure they were firmly strapped to both the bottom bracket and a eyescrew in the wall, can`t say I blame him ! The old pole and aerials were then removed, but even that wasn`t straightforward. Obviously the threads of the V bolts were very corroded, that is not usually a huge problem because you just hacksaw them off, but in this case we wanted to just loosen them so the long pole (with the two aerials on it) slid down so I could reach it then hold it whilst Sean finally removed the Vs. Some WD40, a big spanner and much praying paid off. Sean then removed the top bracket. But how to remove the bottom bracket ? Well Sean reckoned that he could just about reach the bottom one with his ladders right up against the front of the shed. There was a 1.2m gap, and 4 x 1.2m is 4.8m = @ 16ft, which was just enough, particularly if the ladder is tied on. Just removing the old install was a problem…. I`d decided to go for an XB10K aerial, as opposed to the XB16K, because the latter would potentially be overhanging my neighbours property. I`d only just moved in and didn`t want to risk “getting off on the wrong foot” them ! I wanted the aerial as high up as possible in a bid to maximise signal, but I still wanted it to be accessible, i.e. not in line with the aforementioned shed ! This meant installing it slightly lower down as the gable dropped down towards the front (or rear) of the property, thus a 12ft/3.6m pole was the best bet. Installing a reasonably large aerial on a long pole has its own problems however, think about the leverage effect, see the article on this very subject. In fact I had to cancel the install on the day I was going to do it because the wind was too strong, though, as the linked article emphasises, when installing a large aerial on a long pole any significant wind is too much wind ! As stated above, I needed about 7 inches of stand-off, that is to say the 5 inches of the fascia plus our recommended gap of 2 inches. A pair of 12 inch T&Ks would be ideal, though I actually went for a pair of Ks, for two reasons. Firstly Ks are a bit stronger than Ts. Secondly, and arguably more importantly, particularly in this instance, twice as many wall anchors can be fitted. The latter turned out to be very significant when I discovered all the bricks were riddled with voids, in fact there seemed to be as much air in them as brick ! As a result many of the wall anchors (I was using wall screws and plugs - rather than sleeve anchors - because I wanted to use stainless steel screws) wouldn`t tighten up ! Unfortunately this was before I`d discovered universal plugs (now they are bleedin` good….) so it left me with a problem. I did actually manage to get 4 wall anchors in one K by turning it upside down, but with the other K three wall anchors was the most I could get to tighten. I was particularly concerned because it wasn`t the one in the middle of the bracket, the one most installers don`t even use, it was at the end of one of the mounting plates and therefore more important for the strength of the install. I consoled myself with the thought three wall anchors was still one more than if it`d been a T ! I went for a bracket spacing of 18 inches as a compromise between height and strength, remember I was using two Ks so the brackets were stronger than a pair of T&Ks. I have to admit that 6 months later (after experiencing the force of 60mph gusts round our house….) I went back up and managed to get a Universal plug into the unused hole. I didn`t want to take the whole edifice down so had to feed the plug through the hole which is not recommended. However, enough went into the hole for it to tighten up, well the second plug did anyway ! So, that`s a total of 8 wall anchors between two Ks. That`ll never come down. Right, so what kind of signals did we get ? It would have been nice to do a load of testing, but I was in in the process of moving house and therefore short of time. Plus, to be frank, despite the ladder being tied on and me clipped to it, I didn`t really want to spend any longer than absolutely necessary twenty foot up in the air…… Finally, every time I wanted to change the aerial or the aerial`s polarity, it meant getting the 12ft pole down ! Thus I limited myself to one test, seeing what the increase in gain was on the DM Log when it was about 12ft higher than it was in the upstairs rooms (in the initial research mentioned at the top of the page). I checked the DM Log on Belmont and Crosspool. Belmont`s signals were all over the place, some up and some down, basically I`d say they were no better on average. Signals off Crosspool were up 2.3dB on average, and just as significantly, they were all up, none of the frequencies was lower or even just the same. That was a bit of a result, about the only positive of the whole odyssey ! Average signals off a relatively low gain DM Log were 43.3dBμV for the PSBs and 41.6 for the COMs. So, I thought, swap to a higher gain aerial and all should be well to get over the recommended 45dBμV threshold. NOTE : The PSBs (MUXES 1 to 3) and COMS (MUXES 4 to 8) are all theoretically transmitted at about 1kW from Crosspool, but the PSBs have a slightly more omnidirectional transmission pattern and therefore, effectively, more power in the direction of my house. OK, now we were getting somewhere, or so I thought at the time. The next step was to swap to a high gain XB10K aerial which gives an increase in gain (over a DM Log) of between 2 and 7dB. The average increase is 4.8dB (A group av = +3.5dB and B group av = +5.8). However, when the XB10K was up there the increase in gain (over the DM Log in the same position) was actually only 1.3dB ! Even more worrying the peak signal direction varied by frequency, and, in fact, (average) peak signal was about 15 degrees to the left of the transmitter`s actual direction. Both are a classic signs of reflected signals. The increase over the DM Log was only about 1dB……..
Actually, that`s almost exactly what one would expect, about 0.3dB (av) down on the XB10K. It did at least prove that there hadn`t been anything wrong with the latter aerial ! I`ve no idea why there should be such a small increase in signal using significantly higher gain aerials. Possibly the DM Log having a wider acceptance angle was picking up numerous signals bouncing about all over the place, and they were, by pure fluke, in phase. Sounds unlikely but I can`t really think of anything else at present ! So, here`s the summary (av readings in dBμV from a DM Log upstairs room, then a DM Log outside at +12ft then DY14WB outside at +12ft). So, what was the result ? Well we hadn`t moved in yet so I only had a LOWRY set top box and an old Phillips portable to hand. The results weren`t encouraging. I ignored the STBs signal level readings (no STB / TV signal levels are to be relied on) and simply concentrated on whether I actually got the channels. That`s the way to go, apart from anything else, that`s what actually matters. The PSBs were OK, but the COMs were unreliable, more or less what one would expect from the signal readings. I don`t watch much TV actually, and what I do watch is almost all on the PSBs, but the wife watches more and I sometimes watch Yesterday on MUX6 (a COM). Unfortunately the LOWRY box reported that Yesterday was unavailable……. However….. When we finally moved in both my HUMAX PVR and my wife`s Techwood PVR both picked up all the channels. Yes they`re both PVRs, we`ve still got a (non digital) CRT set, it`s fine we`re happy with it. I`m not saying the channels never break up at all, but even at our old address with a stonking signal, the picture sometimes froze a bit. In my experience all digital signals tend to do that every now and again, including satellite. I find the occasional glitch in sound more annoying than the effect on the picture, I really think they should have had more more correction data in the signal, particularly for the sound ! The obvious conclusion is that different tuners vary in their performance. So, if you`re having a problem with channel break up try a different STB or TV. * a BUSH PVR we later bought (to replace the Humax) also picked up all the channels. It is interesting, and very significant, that the only transmissions that increase more or less as one would expect are those from Oughtibridge. I`m pretty sure that`s because it has the clearest line of sight to the transmitter, also see the Black Art of RF. Bearing in mind the DY14WB would also work on Oughtibridge should that prove necessary (plus, to be frank, I really didn`t want to take that bleedin` 12ft pole down yet again) I decided to stick with it. Fit a mast head amp and hope for the best. I set the variable gain on the m/h to give 58dBμV at the TV point on the strongest channel (maximum recommended is 60dBμV). I must add I had another reason for fitting a (4 way) mast head, my wife wants another TV point. I agreed, so long as it was in the kitchen. I find it`s best to encourage wives to spend as much time in there as possible. NOTE : A mast head amp will not improve the signal quality from an unamplified aerial, it will however increase the signal level. This is usually more successful in overcoming the loss from a long cable run or a splitter then rescuing a marginal signal. Postscript : Around 6 months later I went up to put another wall anchor in, and, whilst up there, had another play about with the direction of the aerial. It offended my perfectionist sensibilities that the aerial wasn`t pointing directly at the transmitter ! I wondered whether the original results had somehow been wrong or misinterpreted, plus the trees now had no leaves on them. Would things have changed ? I have to tell you now that the results were exactly the same, so my aerial is still pointing about 15 degrees off to the left of the transmitter. Anyway, peak (average) signal from my aerial is actually about 14 degrees to the left of Crosspool. In January 2018 my neighbour over the back who is slightly higher up than me wanted to put up an aerial. I lent him my meter and advised him to try a Log 36 on both Crosspool and Emley, then go with the TX with the best signals. One would have thought he`d have much better signals off Emley, possibly even attaining the levels suggested by the postcode checker ! Very significantly, despite the fact he was in a superior location, height wise (and line of sight wise to Emley), his postcode prediction was exactly the same as mine ! 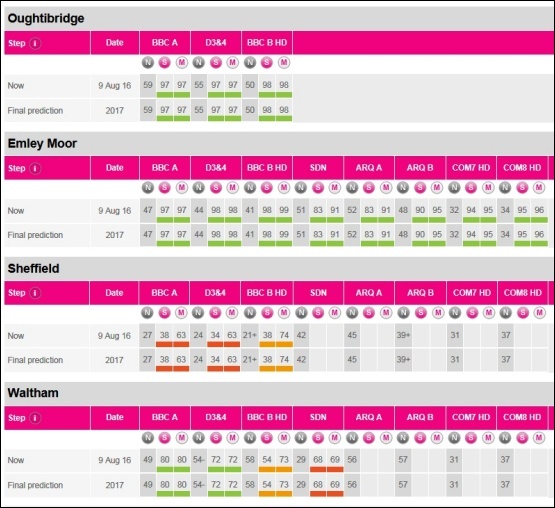 How could that possibly be if postcode predictions were accurate ? (that`s a rhetorical question by the way). Anyway, his results are listed below (compare them to mine - above), though I have deducted 2dB from the actual readings because they were obtained with a Log36 which has about 2dBd more gain than the DM Log I was using for my own initial tests. Off Crosspool, again as expected (remember, this time, neither of us had trees or houses in the way, he just had a small height advantage) my neighbour only benefited from a small increase. The biggest difference was 4dB (on CH21), but, interestingly, some of his signals were actually smaller than mine (worst was -3dB on CH31), the average increase was under 1dB.